I hate wasting food. And since Baby V has started eating solids I feel like I am wasting a lot of food. And yes, I can’t help it when she throws half her food on the floor but I try to minimize the food waste as much as possible. One thing that really bothers me is the fact that the grocery store by my house has only the giant containers of full fat plain greek yogurt, and after you open it, the yogurt needs to be used in 5 days. And I’m sorry but Baby V cannot eat ~32 ounces of yogurt in 5 days (I would actually be quite concerned if she could). My husband doesn’t eat yogurt, and I could probably eat the full fat yogurt, but I prefer to continue to eat my non-fat greek yogurt at lunch so I can limit my calories and save my saturated fat intake for fancy cheeses (it’s all about balance …right?). 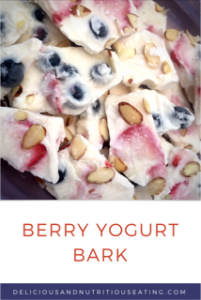 So anyways…I decided to use some of the extra yogurt to make a little something I am going to call Berry Yogurt Bark. It turned out to be a yummy frozen treat that I can slowly indulge in, one piece at a time, or serve to guests when they come over. It is super easy, takes about 5 minutes and looks so pretty. Line a 9×23 in glass baking dish with parchment paper. Add yogurt to a small mixing bowl and stir in honey. 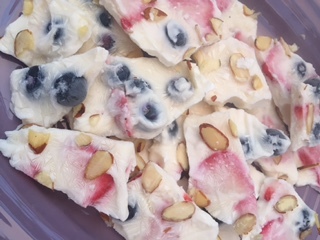 Gently fold berries into yogurt mixture. Spread out over parchment lined baking dish with a spoon. Sprinkle with almonds. Cover and freeze for about 4 hours or until frozen solid. Break into pieces after frozen and serve immediately. Basically, we were removing the laminate floors from our new house and discovered we had a pretty bad mold problem. So me, my husband and our 6 month old daughter had to stay with my husband’s parents for a week, while the mold was cut out of the walls and they cleaned the air. 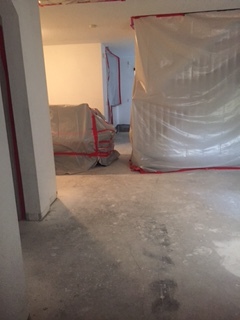 When we were finally able to come back, our downstairs was all concrete with missing wall and ceiling parts so we had to live upstairs while they were rebuilding the downstairs. Our kitchen cabinets were all covered with plastic during the rebuild so we really couldn’t get to anything…so plastic forks and paper plates were our dinnerware. I pretty much only had access to the refrigerator (except when they moved it to replace the floor) and the toaster. I honestly don’t even remember what we were eating during this time…it was all quite a blur of frustration. 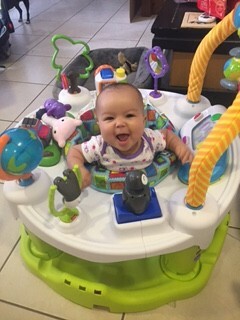 And of course this all happened when my 6 month old daughter was just starting to eat solid foods so it really was not the most ideal time. I had to feed her in her high chair in my bedroom, and of course food would get thrown everywhere, including all over my bed. Luckily it is all over and we have nice beautiful floors downstairs that I will never redo as long as we live here. 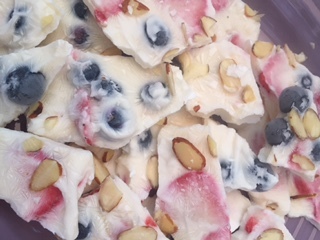 Making your own popsicles out of real fruit is a great way to enjoy a summer treat and also get some great nutrients in for both yourself and your little ones. You can use fresh fruit that is in season, especially ones in abundance, like the mangoes down here in south florida during the summer. 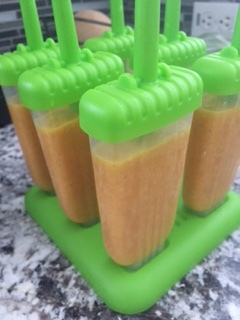 I definitely wanted to use up some fresh mangoes before they went bad and making popsicles out of them sounded like a great idea. 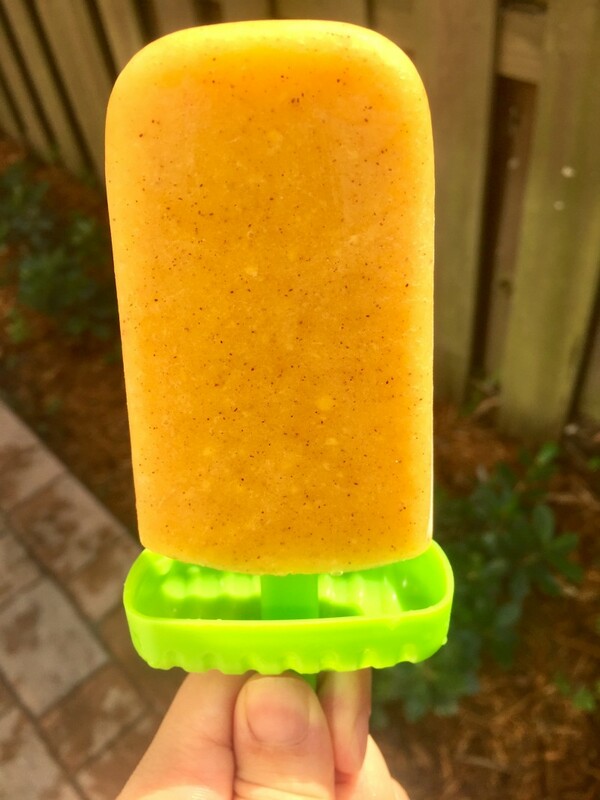 Instead of making popsicles out of just fruit and sugar, I like to add a little flavor depth with things like spices, tea, or vanilla and a little bit of a dairy or non-dairy fat source. 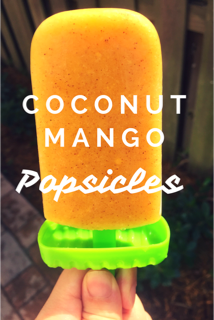 I find that adding a little fat really helps with the consistency of the popsicle so it is not too icy. Add all ingredients to blender and mix until smooth. Pour into popsicle molds and freeze for about 4 hours or until frozen solid. When ready to eat, run warm water over popsicle mold until you are able to easily remove popsicle from mold. Enjoy!